Thomas Zurbuchen, head of NASA’s science mission directorate, said Tuesday that U.S. and French engineers completed the test of InSight’s Seismic Experiment for Interior Structure instrument last week. CNES, the French space agency, is responsible for providing the seismic instrument. The seismometer consists of three sensors inside a vacuum enclosure the size of a volleyball. The container will shield the detectors from dust, wind and other hazards in the Martian atmosphere. But the vacuum enclosure had persistent leaks as French engineers tried to ready the instrument for delivery to the United States in 2015, when InSight was scheduled for a month-long launch window in March 2016. The InSight spacecraft, built by Lockheed Martin, the mission’s German-built heat flow probe, and the United Launch Alliance Atlas 5 booster were ready for the March 2016 launch window. NASA officials elected to suspend the launch campaign in December 2015 when it became clear the SEIS instrument would not be ready in time. The seismometer is central to InSight’s primary science goals — studying the structure of Mars’s interior and unraveling how the solar system’s rocky planets formed. The problem that cropped up in 2015 occurred as French engineers tried to feed electrical cables through ports on the enclosure and seal the container for flight, but the ground team could not overcome persistent leaks. Engineers finished qualification testing of an engineering model of the redesigned enclosure a few months ago, and last week they completed vacuum leak testing of the flight model that will go to Mars, according to Bruce Banerdt, InSight’s principal investigator at NASA’s Jet Propulsion Laboratory. 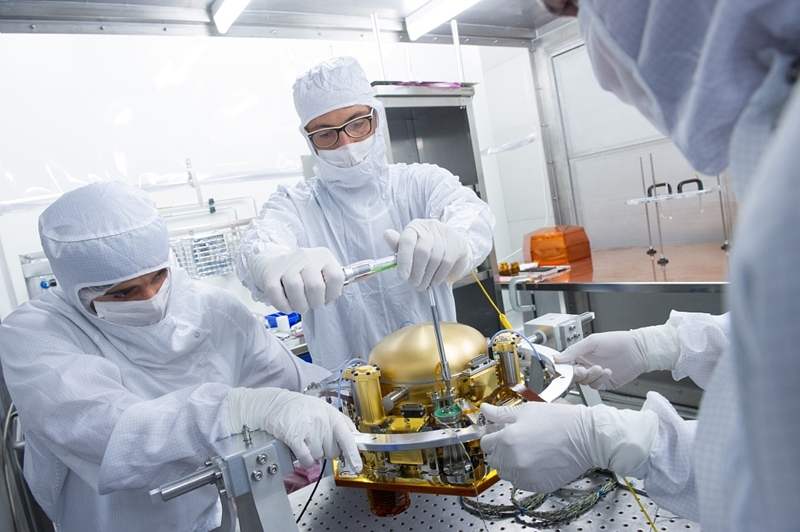 JPL took over redesigning and testing the seismometer enclosure, while CNES remains in charge of developing the sensors themselves, integration of the sensors into the container, and final installation of the instrument on the lander. The tests of the flight model of the enclosure checked its pressure integrity at room temperature and at the temperatures it will encounter at the Martian surface, Banerdt wrote in an email to Spaceflight Now. He said the successful test builds confidence that InSight will meet its backup launch window next year, which opens May 5, 2018. Launch opportunities for Mars missions come about once every 26 months, when the positions of the planets enable a direct journey from Earth. The seismometer instrument will be able to measure ground movements as small as half the radius of a hydrogen atom, NASA said, to sense minor shaking that may originate deep inside Mars. No mission has made a confirmed detection of “marsquakes” before, but instrumentation left behind by the Apollo astronauts discovered such tremors on the moon. 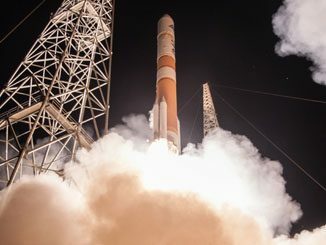 After reviewing the costs of the two-year delay, NASA announced in September that the InSight mission will go forward. 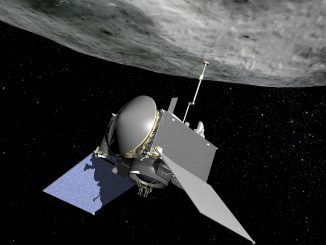 InSight is one of the agency’s cost-capped Discovery-class interplanetary missions, selected in a competition among mission proposals in 2012. NASA said the delay and rework will add $153.8 million to InSight’s cost. The mission’s budget from NASA was originally $675 million, but it will now exceed $800 million. 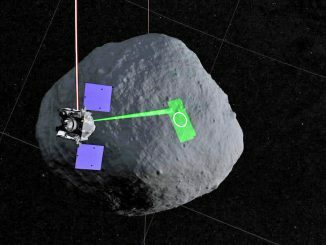 Those figures do not include funding from CNES and DLR, the German space agency, for InSight’s two main instruments. Once InSight lifts off on an Atlas 5 rocket next May from Vandenberg Air Force Base in California, the probe will cruise through the solar system for more than six months before plunging into the Martian atmosphere and braking to a rocket-assisted landing Nov. 26, 2018. 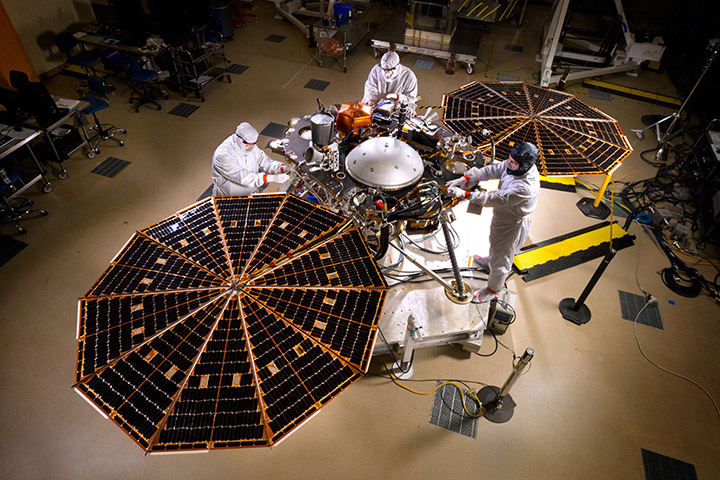 Based on the design flown on NASA’s Phoenix Mars mission that landed in 2008, InSight will use its robotic arm to place the seismic enclosure on the Martian surface to listen for quakes, and the heat probe will burrow to a depth of around 16 feet, or 5 meters, to measure the amount of heat escaping the planet’s interior.